Häfele brand product consits of EPC, Slido, Lift+Turn, Ixconnect etc. The Häfele Group's business figures have continued to develop positively in recent years despite a challenging economic environment. 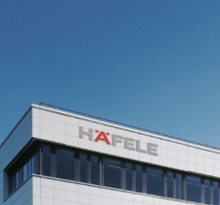 In the 2012 financial year the Häfele Group had revenue of over 1 billion Euros with exports accounting for a 76% share. Häfele has 6,150 employees around the world and serves more than 160,000 customers. These include customers from the furniture industry, dealers, joiners and cabinet makers, as well as architects, planners and builders.